On Sunday, October 15, 2-6 p.m. at Kenmore Middle School, join us at the 2017 Latino American Festival as we celebrate Hispanic Heritage Month with live music, authentic Latino food, artistic presentations, games for kids and much more! The event is FREE to attend! View the flyer in English and Espanol. 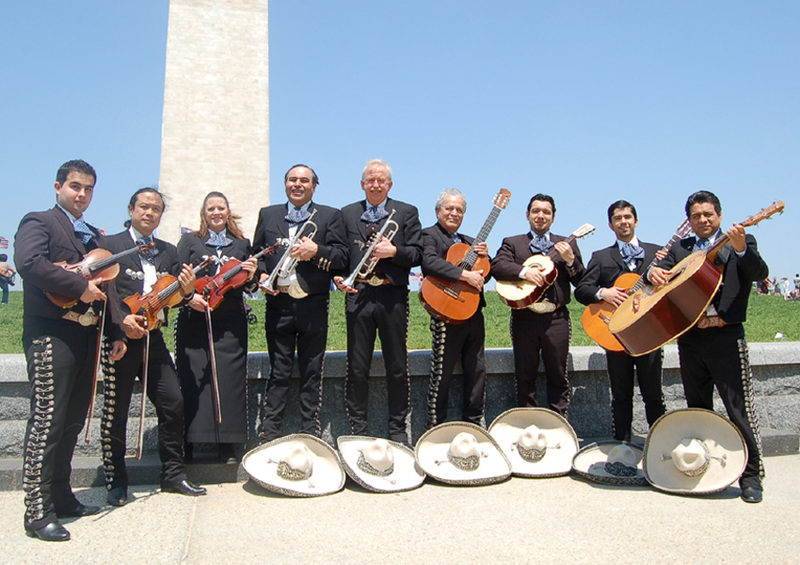 3 p.m.: Bailes de Mi Tierra – Mexican folk dance group located in Baltimore, MD. Since 2008, their mission is to preserve, promote and present Mexican traditions through its music, dance and folklore. With vibrant dances filled with energetic dance moves, accompanied with the lively sounds of Mexican music and colorful costumes, they provide a rich representation of Mexican heritage and traditions. They are ambassadors of Latino community throughout Baltimore, and beyond. *Entertainment subject to change. The schedule of performers will be updated as it is confirmed. 2-6 p.m.: All-ages Quetzalcoatl mask-making project with Arlington County’s Creative Resources staff. Quetzalcoatl was an important deity to the peoples of ancient Mexico. His name means “Feathered Serpent,” and he often was pictured as a snake with feathers. They also believed him to be the god of learning, writing, books, and the calendar. Join in the fun and make your own take-home mask! 2-6 p.m.: Live painting demonstration with Mexican-inspired artist and Arlington resident David Amoroso. David’s paintings feature iconic portraits of everyday people and he also represents Mexican pop culture through his work. Learn more about David and see his work: http://amorosoart.wixsite.com/davidamoroso. 2-6 p.m.: Arlington Public Art presents HOME@Arlington, a book- making project with Arlington-based artist Sushmita Mazumdar. Participants can create an origami-style book that encourages them to think about and respond to the bigger idea of home, which includes public art and public spaces. This project is part of the update of the Arlington’s Public Art Master Plan. Adopted in 2004, the PAMP outlines a strategy for how public art will improve the quality of public spaces and the built environment in Arlington for civic placemaking. 2-6 p.m.: Local henna artist Hennafy will be on site to ink designs on festival attendees. Based in Maryland, Hennafy owner Sadia Ahmed has been a henna artist for over 14 years and uses safe, organic materials suitable for guests of all ages. Limited to the first 80 guests. 2-6 p.m.: Nutrition Booth – participants will have the opportunity to spin the Wheel of Wellness and complete the challenge it lands on. Challenges consist of nutrition facts, trivia, and fitness activities. *Food vendors subject to change. The list of vendors will be updated as they are confirmed. AVF and Trading Solutions: Twisted balloon designs and Helio balloon arrangements. Elocuente Collections: Elocuente Collections is an online African products store that takes pride in promoting diversity. All of their unique products are handmade. They do not just sell but also share the stories and history behind their products as well. Noggin Topper Hair Bows: Festive and reasonably-priced hair bows and hair accessories hand-made by a retired Arlington teacher. Almost all creations are made with ribbon produced in the USA. *Artisan vendors subject to change. The list of vendors will be updated as they are confirmed. AARP Virginia: AARP is the nation’s largest nonprofit, nonpartisan organization dedicated to empowering Americans 50 and older to choose how they live as they age. With nearly 38 million members and offices in every state, the District of Columbia, Puerto Rico, and the U.S. Virgin Islands, AARP works to strengthen communities and advocate for what matters most to families with a focus on health security, financial stability and personal fulfillment. AARP also works for individuals in the marketplace by sparking new solutions and allowing carefully chosen, high-quality products and services to carry the AARP name. As a trusted source for news and information, AARP produces the world’s largest circulation publications, AARP The Magazine and AARP Bulletin. To learn more, visit www.aarp.org or follow @AARP and @AARPadvocates on social media. Arlington County Car-Free Diet: Arlington’s Car-Free Diet is a program of Arlington County Commuter Services (ACCS), a bureau of the Department of Environmental Services of Arlington County, Virginia. The main objective of the program is to educate in a fun way County residents and visitors to lessen the use of their personal cars. By lessening the use of single occupancy cars, we encourage County residents and visitors to consider alternative modes of transportation such as: Metrorail, Bus, Capital Bikeshare, Vanpool/Carpools, personal bicycles, and telework. Arlington County Democratic Committee: The Arlington Democrats will provide information about the upcoming election to attendees and may also have state-wide or local candidates at their booth. Arlington County Department of Environmental Services – Solid Waste Bureau: Trash and recycling services for Arlington County single-family homes. Also administers the Multi-Family and Commercial Recycling Program for Arlington County businesses. Interactive recycling game and program giveaways. Arlington County Police Department: ACPD will have staff advising visitors on career opportunities within the department. Arlington Neighborhood Village: Nonprofit organization helping older residents continue living independently, safely, and with an enhanced quality of life in their homes in Arlington. Arlington Partnership for Children, Youth & Families (APCYF): Commission and County Office focused on supporting parents and children; we will share information and resources to help parents build positive relationships with their children, increase communication, and strengthen children’s abilities to make healthy choices. Arlington Public Art: Arlington Public Art presents HOME @Arlington, a book making project with Arlington-based artist Sushmita Mazumdar (see Arts Programming (above) for details). Arlington Public Library: Information about Arlington Public Library services. Arlington Public Schools: Learn more about topics that will be discussed for School Board action this school year and find out how to stay informed and be involved. Arlington Sister City: Information about Arlington Sister City Student Exchange with Coyoacan Mexico. BEES Academy: BEES (Bilingual Early Education Services) Academy offers bilingual enrichment program for children focusing on reading, writing and mathematics and a tutoring service for high school students in math and science. BEES Academy is the product of the founder’s passion and commitment to the bilingual education of children. Their program provides a learning environment that is joyful, interactive and productive. Edu-Futuro (Educación Para Nuestro Futuro): Local organization working to empower under-resourced Latino and other immigrant youth through education, leadership development, and family engagement to become the next generation of professionals who transform their communities. This fall they are hosting the Emerging Leaders Program I for 9th – 12th grade students. The program is focused on college prep, career exploration and public speaking/leadership skills. Upon completion of this program, students are also able to apply for a one-on-one college mentor their senior year. Historic Preservation Program: The Historic Preservation Program of Arlington County identifies, documents, promotes, preserves and protects Arlington’s significant, natural, cultural, architectonic and archaeological historic resources. In its educational outreach capacity it provides information about all aspects of the program to its diverse community promoting its designated districts. Iglesia Reformada Misionera En Cristo: Missional church working with the Latino community locally in the Prince William County and abroad in Mexico and El Salvador. for bird watching and other outdoor activities. Come visit us for a fun and enriching day experiencing nature. Moms Demand Gun Sense in America: Non-partisan grassroots volunteer organization which advocates for common sense gun laws and safe home storage of firearms. Also has a support network for survivors of gun violence. National Latina Advocacy Network: Bilingual (English and Spanish) information on health resources and and interactive table where families can learn more about access and health. Neighborhood Health: Neighborhood Health is a non-profit medical center providing Medical, Dental, Behavioral Health, Medication Assistance, Ryan White Program, FAMIS / Medicaid Enrollment Assistance to all of those in need. People must be income eligible (at 200% FPL or below). REEP (Arlington Education and Employment Program): REEP is part of Arlington Public Schools that teaches English as a Second Language to adult immigrants, ages 18 and up. They have tuition classes at Arlington Mill Community Center (AMCC) and at Sequoia Plaza as well as free morning classes at AMCC and at Gates of Ballston Community Center. They keep tuition rates low, thanks to funding from the Arlington County Board. About 75 percent of their students are Spanish-speaking. A bilingual staff member will be on site to give information about REEP’s classes and how to register. Spread the Vote – Arlington: Non-profit, non-partisan grassroots campaign whose goal is to help Virginians obtain a photo ID that will allow them to exercise their right to vote in the elections. They will remind attendees of the coming election; remind voters of the photo ID requirement; and to initiate the photo ID acquisition process with anyone who is interested. All services will be provided at no cost to Virginians. Victim Witness Program at the Commonwealth’s Attorney’s Office: This office works with victims of crimes in Arlington County and the city of Falls Church, in collaboration with the Commonwealth Attorney’s Office. Their role is to provide victims with information of their rights, for instance, information about Protective Orders, counseling and financial services as well as information about the criminal case and accompany victims to court. Will provide brochures about our program, lanyards and water bottles free of charge. *Community/non-profit vendors subject to change. The list of vendors will be updated as they are confirmed.